As I walked to each of the elementary schools on Thursday I was greeted by chalk drawings and well wishes for a great summer. We had a very good school year. Rolling backwards from a fantastic graduation ceremony, we gained ground academically once again; got ahead of mental wellness, safety, and substance use action; and most importantly, we watched your children grow! Summer 20 years ago meant I wouldn't see students again until varsity sports started in late August. With Parks and Recreation, camps, summer school, driver's education, and sports, I am sure to see many of your kids this summer at one of the schools. This is not a bad thing as long as they are also getting a chance to regroup and recharge! 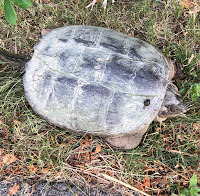 You may see some unusual traffic at the high school this week. Workcamp is in town from last night through Saturday. and we are hosting about 400 multi-denominational teenagers as they go out each day into the community to repair homes for the elderly and less fortunate. Most, if not all, local businesses are also pitching in to help feed and entertain them while they are here. This is a really positive and great thing for our community, so be sure to welcome them if you see them. I will be working all summer but will slow this blog down to about once every two weeks throughout the summer. Please accept my best wishes for a wonderful summer, and I will see you soon. I hope that everyone had a great Father's Day. Like many dads, mine taught me some things that helped get me through to adulthood; and other things that will last a lifetime. 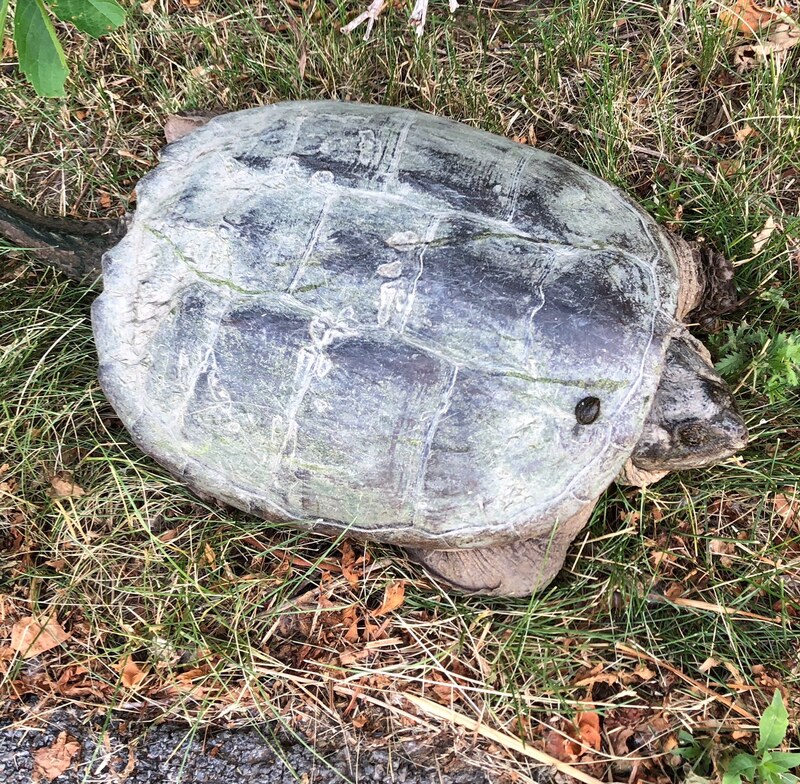 One pro tip was not to put my fingers near snapping turtles, like the one pictured that I saw yesterday while running on the Onondaga Creekwalk. In all seriousness, thanks for everything, Dad. We held our graduation on Saturday and it was as beautiful as ever. I have known the seniors for a really long time, so it was really tough to let them go. I thought that the student speeches were excellent (mine is below), and the musical selections were really inspiring. It was also really cool to watch Kimberly Sacco cross the stage and receive her diploma, 30 years after her classmates did. She was in the Class of 1988 but could not graduate due to a bone cancer diagnosis. Shaking her hand on the stage was a very emotional moment. It was also really heartwarming to watch our Executive Principal, Shannon Coholan, preside over her very first high school graduation. This was number 18 for me overall so there are things that I take for granted. Ms. Coholan got to breathe it all in for the first time and it was really nice to see her very proud parents up in the stands. 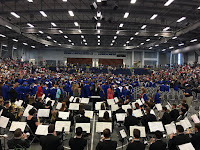 Congratulations to all, and a special thanks to Andy Perry for directing the music, and to Becky DeCesare, Eliza Spaulding, and Leandra Kovalchik for working with the seniors all year. Today is going to be really warm, and we are very lucky to have air conditioning. We will make sure that the students stay cool and safe. Luckily the rest of the week looks to be a little cooler. Good Afternoon, and Congratulations to all of our seniors and thank you to all of our parents for sharing your greatest gift with us. If you are here for your first graduation, I want to ease your concerns and reassure you that my speeches are always four minutes or less, or your next one is free. Graduates, having known you for so long I have been able to watch you grow, learn, and develop your personalities and character. To say that I am proud of you is an understatement. You were tremendous role models, ambassadors, and examples for our younger students, as well as our community. When I think of all of the experiences and time we have shared together, I want to leave you with two thoughts that are unique to you and your class as a whole. First, I am always asked to “describe the senior class.” At Senior Ball, we enjoyed a really cool fireworks show. There was one in particular that launched up and had a pulsating light as it rose. It went higher than the others, and I could feel the suspense building in all of us. When it exploded, it was bright and vibrant, more so than the other fireworks we had seen. Then, little rockets shot out of the glowing light. In a nutshell, that firework best describes you as a class; bright, vibrant, explosive, and memorable. Second comes a cautionary tale. When I started running years ago, I used to see the finish line and would actually slow down a little because, why not? I was almost there. Other runners would pass me before the finish, and I did not give it much thought. At one race, after a particularly tough training season, I saw the finish line and my brain started to tell me to slow down a little. My heart and body took over from there and I sprinted through the finish, passing people along the way. I worked just as hard as every other runner if not harder, why should I let them win? The moral of the story is that while you have excelled, this is NOT the finish line. Consider it a water stop. Life only has one true finish line - so my advice is to enjoy the ride and every milestone that you will cross, but also to keep the hammer down and have no regrets! You have too much to offer to the world to not give your best throughout your life’s journey! 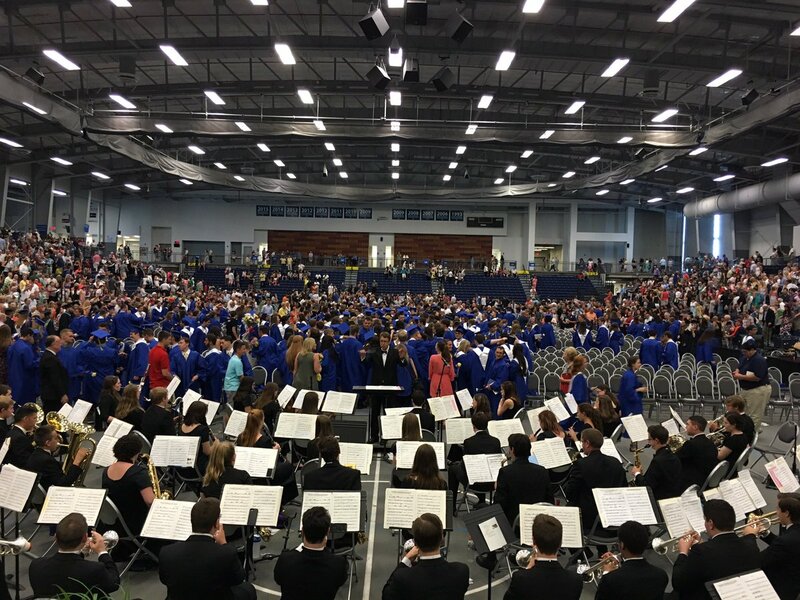 Congratulations to the Class of 2018, thank you, and good luck! Athletics Updates: I hope that all of you had a wonderful weekend. The weather could not have been better! You know you have had a successful spring sports season when we are still competing in June. Our track and field state runners did very well for themselves over the weekend. Carly Benson earned 1500m medals at the state competition: 4th place in the D1 Public School category and 8th place in the Federation Championships. Emily Young finished in 12th place in the 800m at the state competition and the 4x100 relay team placed 14th. We could not be more proud of them! As I was watching our Boys Varsity Lacrosse team play Ward-Melville, I was wondering to myself which college lacrosse teams they could beat. We have some exceptional, all-American talent on our team. They gave it their all; it was just not enough. I congratulate them on a great ride! Also, I appreciate the support they received along the way, especially everyone who made the trip to St. John Fisher, considering many of you could have watched it at home. As Coach Mike Messere's legendary tenure comes to a close, I did want to comment about this season. First, we wish Coach Messere and Coach Deegan well in their retirement, and the process to secure replacements will begin right after graduation. As the Superintendent, you never know where your next challenge will come from, and one of those challenges came from the lacrosse season this year. When you have a legendary multi-generational coach, public opinion about "how things should be," really varies, and it can make for divisive conversations. It also puts kids in the middle. I have known our senior players since they were in second grade, and the underclassmen even longer. I know their character because I have watched them develop it. I have watched them succeed, fail, and learn for a long time. I was not there for the interview after the game because I did not have a field pass, but somewhere in that interview, the players were characterized as being quitters. Everyone is entitled to their opinion, but I strongly disagree. I think there was a disconnect for sure between the players and coaches, but the fact that the kids had every opportunity to say something negative when they had their time with the media and didn't, says a lot. It speaks to their character. They took the high road. They also had to endure the intense pressure of trying to win with the watchful eyes of prior generations on them constantly. No other group of kids will be asked to do that. They were given a challenge, accepted it, and showed their heart all season. I wish them the very best, and they have plenty to be proud of. Seniors Visit their Elementary Alma Mater: Last week was the last week of classes for high school students. 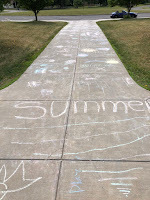 The seniors carried on the tradition of visiting their elementary schools on the actual last day and it was a heartwarming time for the students and their elementary teachers. They were also great role models for the younger students! Graduation is Almost Here: Graduation is Saturday, June 16, and we are looking forward to another great ceremony. There will be someone graduating on Saturday from the class of 1988. Yes, you read that right. Let me explain. Kimberly Sacco was a member of the class of 1988. She was very involved in school, participated in just about everything, and was a great student. Just prior to graduation, she was diagnosed with bone cancer and she had to immediately undergo treatments. Because of this, she never officially crossed the stage to receive her diploma. Fortunately, she was able to beat cancer and for the past nine years has been an important member of our Board of Education. She will be retiring from the Board of Education at the end of June. We thought it would be fitting for her to attend graduation and receive her diploma on the 30th anniversary of her diagnosis, and as her career on the Board of Education comes to an end. Graduation is about the whole class, so if you are attending you will recognize her by the asterisk next to her name. She will process with the students and receive her diploma exactly as every other student will. Congratulations and thank you to Kimberly for her service and perseverance! A Busy Week Ahead: This week is super busy. There are final exams at the high school, field trips at the middle and elementary schools, the Athletic Awards Reception on Tuesday night, and the Onondaga County Safety committee meeting on Thursday! Thanks and enjoy the week! I recently learned a term from the students that I can't seem to stop saying. The word is "extra". Yes, I have heard of the word extra, but students are using the term in a unique way. If you are driving a bunch of kids somewhere and you hear one of the kids say "my mom is so extra" it means that the mom was over the top about something. Because of this, if I walk into a cafeteria and it is a little louder than normal, I will say, "the cafeteria was a little extra today." I am actually starting to annoy myself (and probably others) by using the term so much, so I need to pass it along to you to keep it alive. A Busy Weekend: Anyway, I hope you had a great week last week. The Wildcat Nation sure did! Golfer Nick Bove made a name for himself on the course in state competition and advanced to the final round. I played in my first competitive golf tournament in a long time and held my own, visited the Taste of Syracuse, and had a chance to attend the grand opening of the new Red House Theater on Salina Street (in the old Sibley's building). If you are a fan of theater at all, the new Red House location is very much worth the trip to check out. We took in La Cage aux Folles and were not disappointed. A lot of our employees participated in Paige's Butterfly run over the weekend for many different reasons. In addition to supporting pediatric cancer research, 20 of our football players, many of their family members, coaches, and the parents of Joe Adams (teacher and West Genesee coach who passed away from cancer) ran the race in Joe's memory. It was just another reminder of just how influential educators are. Congratulations to all who were recognized at the Fine Arts Reception on Friday night. You know how competitive our fine arts program is so to be recognized for anything in the program is a "big deal!" The Week Ahead: We have a very busy week ahead. On Monday, we have the Senior Awards Night and that is a wonderful chance to sit back and watch students receive recognition for all of their hard work. Congratulations to them and their parents. Also, Nick Bove plays in the final round of the NYS Golf Championships. On Wednesday, about 170 of our employees will be participating in the Chase Corporate Challenge. Our group is the fifth largest and helped the District to win the Chase Scholarship that is worth $1,500 for our students! 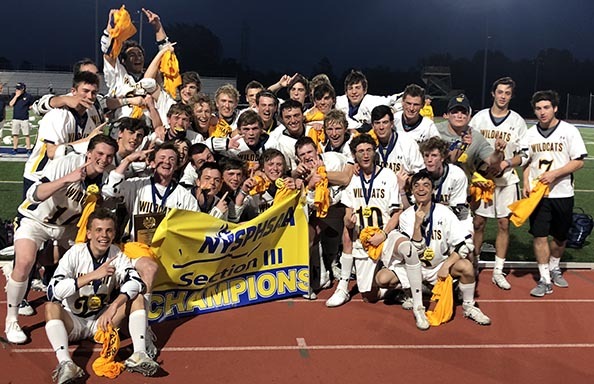 Wednesday is also the New York State Boys Lacrosse semi-final game against Lancaster, so we are going to be spread out and busy. Friday is the last day of classes for students at the high school. It is also "Senior Walk" day; when our seniors hop on buses and visit their elementary schools as role models for our younger students. They also get to visit the people who helped them start their school careers. It is a great morning! During the day, our track and field athletes will begin their competition in the NYS Championships at CNS!